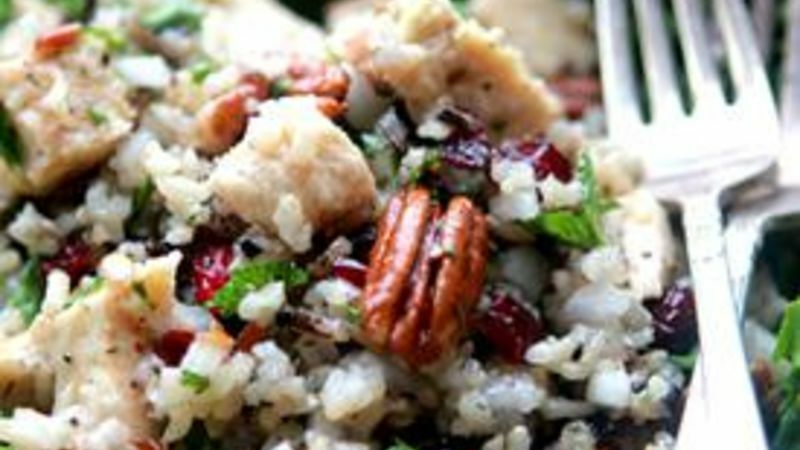 In a large bowl, toss together the cooked wild rice, diced cooked chicken, dried cranberries, pecans, onion, and parsley. In a small bowl, whisk together the olive oil, lemon juice, vinegar, maple syrup, and dill. Drizzle over salad. Salt and pepper to taste. Serve immediately or store covered in the fridge for up to 24 hours for even richer flavors. The prep time listed for this recipe assumes the wild rice is already cooked. Cook it in large batches and freeze it ahead of time for quick use in recipes like this. Pre-cooked wild rice is also available in cans at many grocery stores. So you're a wild one, huh? Then this one's for you: Hearty and healthful Chicken & Wild Rice Salad! Wild rice was once a staple in the diet of many Native American tribes. Today, it's considered a delicacy in many parts of the world. In terms of diet and nutrition, wild rice trumps most rices in the amount of protein, minerals, B vitamins, folic acid, and carbohydrates found in each serving. So let's embrace a new grain in this fab Chicken and Wild Rice Salad recipe! First, you're going to need some cooked wild rice. Buy it or cook it ahead of time and let it cool. (There more about that at the end of this article.) After that it's a snap. Dried cranberries and halved pecans-- they add a bit of sweet, earthy flavor to this chicken salad. Taking a tip from tabbouleh, add in a bit of chopped parsley for color. A bit of chopped onion, then a drizzle of tangy-sweet dressing and you're good to go! Combine it all and ... yummers! Dish up your salad and enjoy it for lunch or dinner. In my own kitchen, I keep wild rice on hand, but rarely use it because it feels so much more finicky than other rices. It requires a longer cooking time, and doesn't pair perfectly with every meal. So, I often leave that wild stuff on the shelf and opt instead for the less healthful white rice. If you, like me, have been making excuses, eschewing wild rice for the more simple, basic grains, it's time we pull that container off the shelf and work some serious magic with the stuff! This beautiful recipe is quite simple to whip up and happens to be so delicious, it's almost addictive! Besides ... did you know you can buy canned wild rice already cooked?! Now, there's the easy way to integrate a great grain into your everyday life! If you cook it yourself, the proportions are 1 cup of rice to 2 cups of water. Plan on about an hour to prep and cook the rice on the stovetop. If you're looking for a way to make it yourself but cut down on prep time, try making a big ol' batch of wild rice one day, then spoon it into freezer bags. These bags can be quickly thawed for snappy preparation of this meal, or any other recipe that calls for wild rice. You're also going to need a single breast of chicken that has been cooked and shredded. What have you made with wild rice?